Creamy Potato Kielbasa and Kale Soup is complete comfort in a bowl that’s perfect when the weather gets chilly! It has FINALLY cooled off here! Since Labor Day, all I have wanted was to pull one of my Dutch ovens down and make soup! The temperature dipped to 40 degrees last night so I made my husband light our gas fireplaces to take the chill off in the morning. So wonderful to be able to pull the covers up at night then get up in the morning, grab a sweatshirt and turn on the fireplace. Finally fall! And why not a family classic! 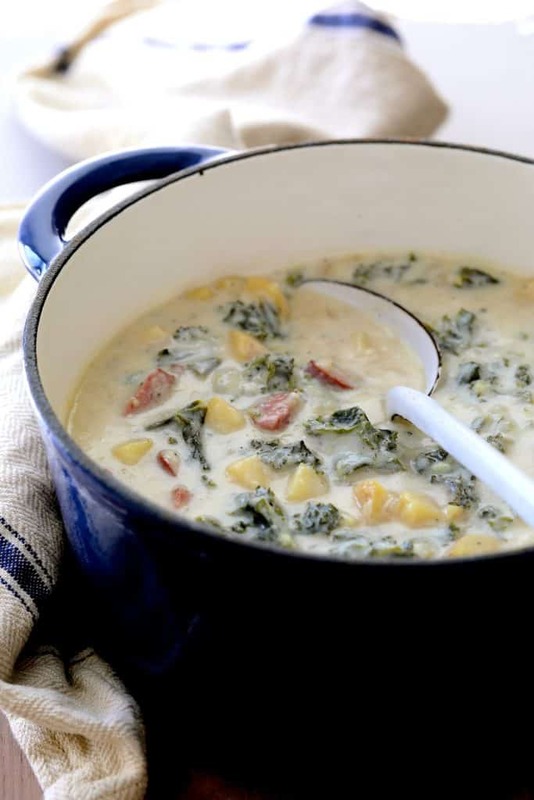 Creamy Potato Kielbasa and Kale Soup is a twist on a recipe I “married” into. My mother-in-law, Shirley, makes an amazing potato and cabbage soup that we absolutely love! We make it at least once every winter. I talk about my mother-in-law’s potato and cabbage soup in this post for Parmesan Roasted Cabbage Wedges. A single head of cabbage can go a long way–especially when there are only two people in a household so I don’t buy one very often. Instead, I used a bunch of kale I had on hand. The kale is perfection and updates it to 2017! I haven’t done a DNA test yet, but all indications are I’m 100% Polish. My mom was Polish, my dad is Polish, my grandparents and great-grandparents on both sides were Polish. Yeah, it’s looking like I’m Polish, too. So, what better way to honor my heritage than to add kielbasa! I also added my own flair to this family classic by making it just a tad lighter. The original family recipe calls for two cups of half-and-half. I decided to scale it back to one cup of half-and-half. The butter, flour and half-and-half combination will get crazy thick, so add a ladle or two of the liquid from the soup to make it manageable, then pour it into the soup. Simmer until thickened and serve! 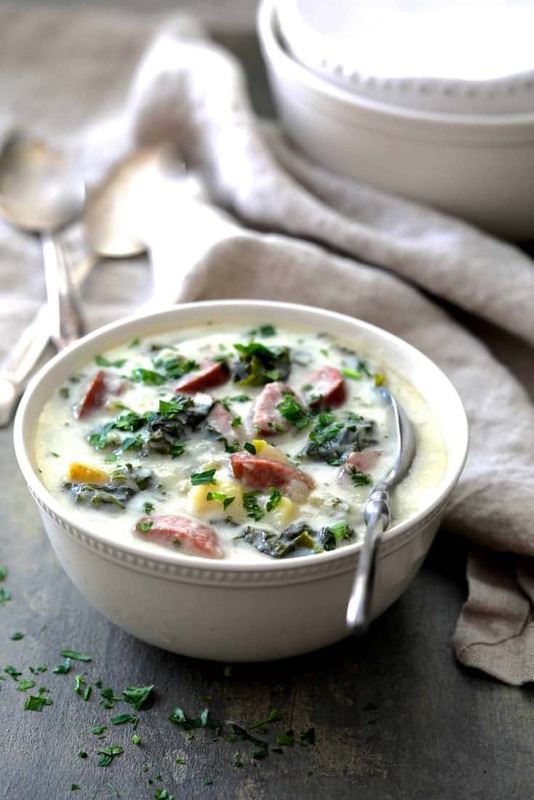 Creamy Potato Kielbasa and Kale Soup! Total comfort in a bowl, my reader friends! Perfection! For another great rustic, Polish-inspired soup, be sure to make my Farmhouse Cabbage Soup with Cannellini Beans and Kielbasa! Soup season is here in full force and I really could not be any more excited about it. This looks absolutely incredible! Hi, Karly, Thanks so much! This soup is the definition of soup season! I’m just trying to figure out a way to make this creamy without using any dairy (for my very lactose intolerant daughter), while retaining as much of the original flavor and consistency as possible. I’m guessing the choice might be rice milk over any of the tree nuts. I’m not as worried about the calories and/or fats as I should be, but so be it. It all looks so very delicious! 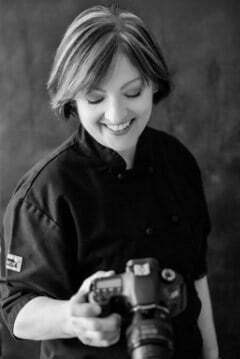 Hi, Kasia, Thanks so much for your great question! I use soy cream cheese for a lot of my dairy-free personal chef clients to add that creaminess without dairy. The brand is Tofutti and it works great! You might want to whisk it with some of the broth first so that it doesn’t separate, then add it back into the soup. Please let me know how it worked for you!